A transitional care intervention program appears to have achieved the goals of improving patient outcomes post-discharge, lowering costs of care, enhancing quality of life, and preventing hospital readmissions. Nearly one-fifth of elderly patients discharged from inpatient care are re-hospitalized within 30 days, costing Medicare $17.4 billion annually. Transitioning from one care setting (typically the hospital) to another (typically home) can be a confusing time for patients and caregivers, particularly among those aged 65 or older. The often-hasty transition process can lead to quality and safety problems contributing to sub-optimal patient outcomes and hospital readmissions. Patients often do not have a good understanding of their medication instructions, self-care techniques, how to identify symptoms to report, or the importance of timely follow-up with their healthcare provider. Transitional care interventions have shown success in preventing recurring and avoidable readmissions of chronically ill or at-risk adults after a hospital discharge by utilizing home visits, encouraging timely visits to healthcare providers, promoting chronic-disease self-management, and encouraging more collaboration between disciplines. Interventions often include well-trained healthcare providers educating patients and their families on how to identify common problems that may arise during and following transitions in care. Transitions-of-care models may involve a hospital visit, a visit to the home, and/or follow-up phone calls during a 30- to 90-day post-discharge period. High-intensity interventions—such as nurse-led care coordination, good multi-disciplinary communication, and a visit to the patient’s home within 3 days of discharge—have also been found to prevent 30-day readmissions. In 2011, Sun Health, a nonprofit based in Surprise, AZ, launched a transitional care intervention program aimed at improving patient outcomes post-discharge, lowering costs of care, enhancing quality of life, and preventing hospital readmissions. The program, Sun Health Care Transitions (SHCT), joined a federally funded demonstration project in 2013. Sun Health’s program recorded the lowest 30-day readmission rates of all participants in the recently concluded Community-based Care Transitions Program, overseen by CMS. Since its inception, Sun Health has reduced 30-day readmissions by 57% from what would have been expected according to the national average of about 18%, achieving a readmission rate of less than 8% (Figure). The reductions in readmission led to an estimated savings of $17.3 million since inception of SHCT, based on Medicare’s actual cost of readmission of $12.8 million compared to an expected $30.1 million. Like several other care transitions models, SHCT’s program consists of a personal health record, medication reconciliation, prompt follow-up with a physician, and patient education including warning signs of serious problems and how to respond. Sun Health modified the model to address the social determinants of a patient’s health, such as medication affordability, transportation, health literacy, and social isolation; when needed, patients were linked to helpful resources in the community. Sun Health also had a social worker available to consult with patients when there were multiple psychosocial issues or placement needs. Registered and licensed practical nurses served as “transition coaches,” based on the belief that nurses are better equipped than other healthcare providers to help patients understand their illness, teach them how to better manage their own care, and connect them to community-based services to help manage their health. Under SHCT, which is currently still in use, a licensed practical nurse (LPN) meets the patient in the hospital and calls the patient after discharge to begin the intervention and to schedule the registered nurse’s (RN) home visit. The RN teaches, reviews medications, and completes a patient assessment that includes evaluating the person’s fall risk and screening them for depression. Depending on the person’s health literacy and urgency, the nurse may instruct the patient on how to find reliable answers to health-related questions. In urgent situations, the nurse will call the physician, with the patient on the line, for resolution. The LPNs then reinforce the patient’s plan of care and provide ongoing support through weekly calls. For physicians and policymakers looking to replicate this program’s success, Sun Health leaders recommend starting with an evidence-based program and having a clear, long-term strategy for achieving results. They also tout the value of home visits and the resulting benefits that come from one-on-one work with patients. 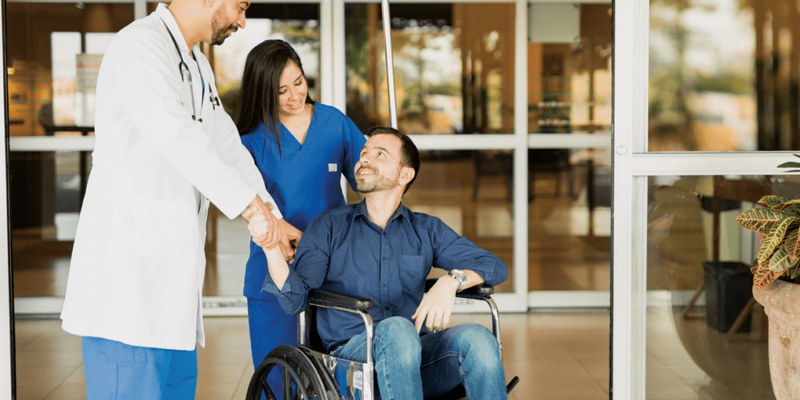 This provides important insights for physicians and hospitals as they seek ways to improve patients’ post-discharge outcomes and prevent avoidable hospital readmissions. Arbaje A, Kansagara D, Salanitro A, et al. Regardless of age: incorporating principles from geriatric medicine to improve care transitions for patients with complex needs. J Gen Intern Med. 2014;29: 932-939. Coleman E, Boult C. Improving the quality of transitional care for persons with complex care needs. J Am Geriatr Soc. 2003;51:556-557. Coleman E, Smith J, Frank J, et al. Preparing patients and caregivers to participate in care delivered across settings: the care transitions intervention. J Am Geriatr Soc. 2004;52:1817-1825. Davis M, Devoe M, Kansagara D, et al. Did I do as best as the system would let me? Healthcare professionals view on hospital to home care transitions. J Gen Intern Med. 2012;27:1649-1656. Enderlin C, McLeskey N, Rooker J, et al. Review of current conceptual models and frameworks to guide transitions of care in older adults. Geriatr Nurs. 2013;34:47-52. Gardner R, Li Q, Baier R, Butterfield K, Coleman E, Gravenstein S. Is implementation of the care transitions intervention associated with cost avoidance after hospital discharge? J Gen Intern Med. 2014; 29: 878-884. Greysen S, Hoi-Cheung D, Garcia V, et al. “Missing pieces” functional, social, and environmental barriers to recovery for vulnerable older adults transitioning from hospital to home. J Am Geriatr Soc. 2014; 62:1556-1561. Jeffs L, Lyons R, Merkley J, Bell C. Clinicians’ views on improving inter-organizational care transitions. BMC Health Serv Res. 2013;13:289. Peikes D, Lester R, Gilman B, Brown R. The effects of transitional care models on re-admissions: a review of the current evidence. Generations. 2012;36:44-55. Schuller K, Kash B, Gamm L. Enhanced transitions of care: centralizing discharge phone calls improves ability to reach patients and reduces hospital readmissions. J Healthc Qual. 2017;39:e10-e21. Verhaegh K, MacNeil-Vroomen J, Eslami S, et al. Transitional care interventions prevent hospital readmissions for adults with chronic illnesses. Health Aff (Millwood). 2014;33:1531-1539. Yu, D, Lee D, Stewart S, et al. Effect of nurse-implemented transitional care for Chinese individuals with chronic heart failure in Hong Kong: a randomized controlled trial. J Am Geriat Soc. 2015;63:1583-1593. Jeff Ronn, MD, has indicated to Physician’s Weekly that he has no financial interests to disclose.